Find a vacation apartment to rent in Barcelona from our long list of vacation rental apartments. Filter the accommodation selection by various options to narrow down to the self catering vacation apartment in Barcelona that best fit your needs. This beautiful holiday home is located just minutes from the beach in a very prestigious residential area. This cosy and bright holiday apartment with communal swimming pool is located on the beachfront of Santa Susanna, a popular destination for families due to its great leisure facilities. Next to its fantastic terraces, this beautiful holiday home with its spacious living room and the proximity to the fine sandy beach of St. Vicenç de Montalt and all amenities. This practical holiday apartment is located directly on the beach on the road which combines Malagrat de Mar and Santa Susana. With communal pool area, tennis and basketball court. This spacious 3 bedroom apartment is located in the center of Calella, just 400 meters from the beach. The area has a spa, a golf course and a water park. This spectacular house is located in a privileged residential area of ​​Calella, a coastal village in the heart of Costa de Barcelona. This cozy holiday home is located on the Costa de Barcelona, in the urban area of Malgrat de Mar. From this exclusive holiday villa, you can have a spectacular view of the Mediterranean. The original and stylish interiors with a lot of comfort makes the holiday dreams come true. This fantastic holiday home will delight you. The spacious interior is decorated with designer furniture and with loving attention to detail. 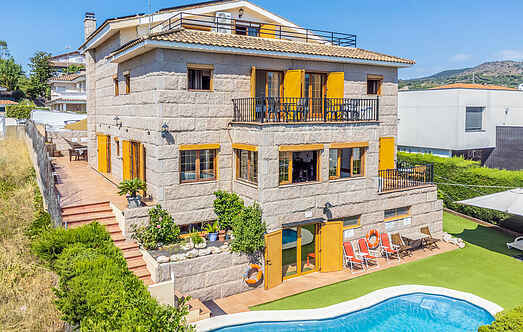 This modern, fantastic holiday home on the coast of Barcelona has an on-site swimming pool and a garden, so you can enjoy the sunny Mediterranean climate. This is a nice apartment with elevator, right at the beach front of Malgrat de Mar. The balcony offers an exquisite view of the huge shared pool. The high-quality and stylish decor of this villa is breathtaking. This beautiful holiday home from the 18th century has been tastefully and lovingly renovated. This spacious holiday home is the ideal place to spend an excellent holiday with family and friends. The private pool and the large terrace offer impressive views of the surroundings. The great details of this delightful 3 bedroom holiday home will delight you.